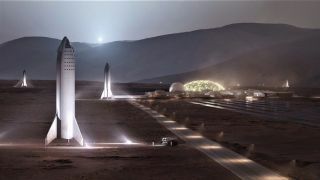 An artist's illustration showing SpaceX Starship vehicles on the surface of Mars. This rendering predates the most recent Starship design, which envisions the vehicles being made of stainless steel. SpaceX's Mars ships won't be ferrying just the super rich to and from the Red Planet, if everything goes according to Elon Musk's plan. Follow Mike Wall on Twitter @michaeldwall. Follow us @Spacedotcom or Facebook.